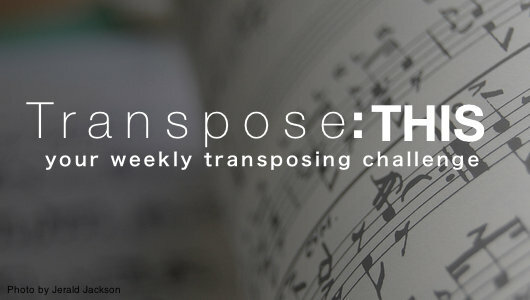 Every week we offer up a new transposing challenge. Acoustic: Last week we asked you to take off the capo and on Alive by All Sons and Daughters and play the same riff. Whenever I have a droning open string I always figure out where I can play that note and then figure out the rest of the riff around it. In this example, removing the capo requires you to hold the 4th fret of the D string so I came up with these two ways to get the job done. Either would work. I prefer the first way but that's just me. Lead: I asked you to play the chords for the same song using a slide. First thing you would have to do is figure the chords without the capo. The song is in the key of Gb but capoed on the 4th fret played in D so using your nifty transposing cheat sheet you should have gotten Gb/Bb B (Cb since we're in Gb) and Db for your main chords. They are all major so I just eliminated the slash chord and played triads based on the root chord like this. That make sense? Try it along with the song. Acoustic: One of the most common capos for A is capoing on 2 and playing like the key of G. Give that a shot. Lead: Try playing that lead tag in the key of E.
As always, relevenat links are tagged below and I'll be happy to take questions in the comments. Only one groove on this one! Easy peasy! So So easy and lovely! Huge tune with a great lead countermelody on the chorus. I have enjoyed your web page and wonder if the site explains any of Tommy walker songs and lead guitar? At my church, Walker's music is played and is uplifting. I would appreciate knowing if this site will look at his playing and dissecting his approach to the guitar. I'm not really familiar with much Tommy Walker but if you have specific questions about technique I'd be happy to answer.